There is no obvious way to make money from trading, which is why most traders lose money, it takes time and study to build systems with an edge. Trading is definitely not as easy as some vendors and educators would have you believe. I believe so many start trading in the belief that they will have fantastic riches with very little effort. Sadly, they will be in the 95% that lose and give up. Most accounts have been blown because people lack the discipline and patience to follow a trading plan, if they even have one! Trading is contrarian to our emotional decision making. Basically, that which is EASY to do is almost certainly the WRONG thing to do. It is easy to take your profits when you have a winner and that is why it is WRONG. 95% of traders take profits way too soon because it is the EASY thing to do and because of this they never generate the handful of big winners that are required to pay for any and all the small losing trades. 95% of traders lose money at the end of the year because they do the EASY thing. If we want to be part of the 5% that makes money, then we have to do the HARD THING. This is what it takes to be successful. 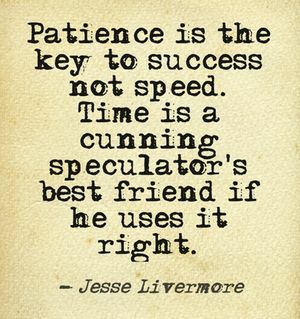 Becoming an expert in trading patience does not happen overnight. It takes time and practice. I often feel anxious when I run a course and end up with a whole new batch of people following me. The reason is simple, I take on some of the emotional turmoil that comes with any new trader or follower of my site. I want them to win with me immediately and never look back. But, losses are also part of the game, and while they are always small in comparison to the wins, they can come consecutively too. Those that have been with me for years I do not worry so much about. Sure, all of us, veterans or not get excited when the system is killing it as it has been for most of this year, but we also appreciate that it won’t win all the time. And, lets face it, emotionally it is easier to be losing previous profits than it is to lose any of your original starting balance. And all people that are new to my site start somewhere. So, anyway, as I watch the current trade finally lift into profit after days of patiently waiting for it to do so, it fills me with a sense of relief for those that are new to this in particular. Hang in there, it takes patience to be successful here. Now bring on the bulls!